The 2nd ever WIMIM! Initially, the inspiration behind this month's theme was the new Captain America movie released this month in Australia. I thought the first movie was brilliant (hellooo Chris Evans ;D) and I am looking forward to seeing what they do with the sequel. Lately I've fallen off the diet-bandwagon quite badly and decided to throw together some wholesome "super" pancakes which would make me feel a little less guilty. There were 2 types of pancakes involved, spinach/blueberry and banana/oats. Spruced it up a little with some inspiration from the infamous Captain America shield, and voila! The final result was a very filling and colourful breakfast with a variety of complimentary flavours and textures. Added bonus, they're much healthier than they taste. 3. 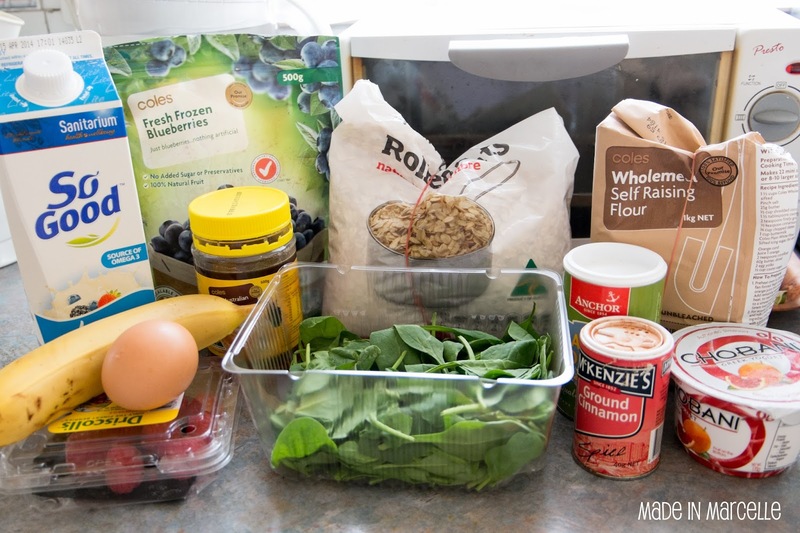 Puree the blueberries and spinach in a blender. If the mixture is too thick (especially if you're using frozen berries) then add a little water. 4. Mix the puree with 1 half portion. 5. Mix the rolled oats into the other half portion. 6. Pour/ladle mixtures onto a non-stick pan on medium heat. (I used some coconut oil to grease my pan) Cook for about 1 1/2 minutes or until it starts to bubble, then it's time to flip. 7. Time to plate it all up. See picture below for assembly ideas. The banana sauce is optional, you can always use plain Greek yoghurt. 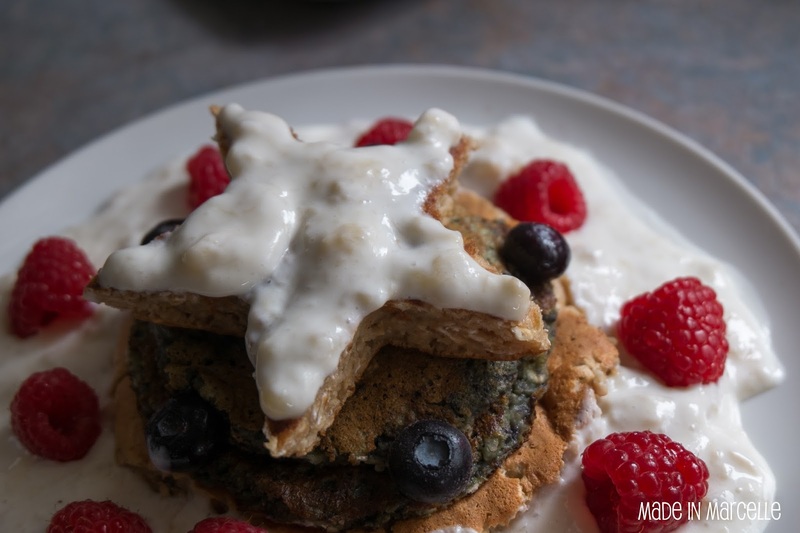 You may notice in the pictures that my top star pancake was much thicker than the rest, this is because I was a little overly enthusiastic with my oats. So it made them much bulkier. 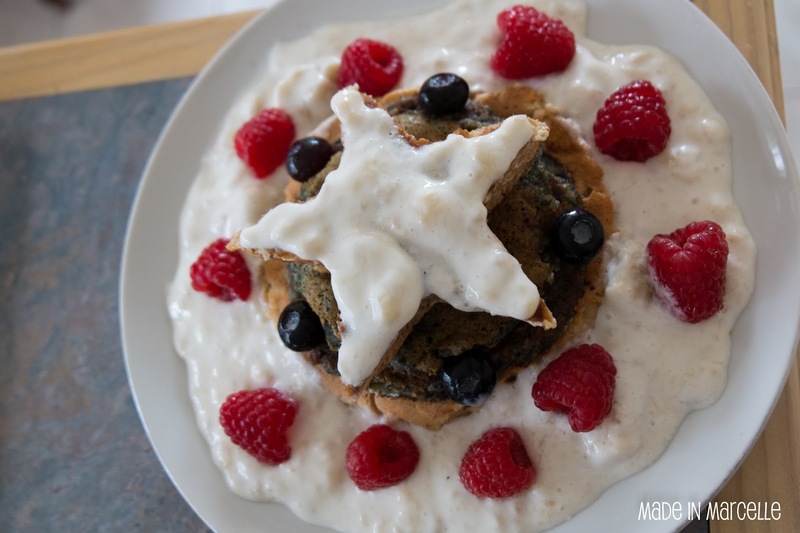 Ideally I would've liked the coloured pancakes to be more blue but the spinach did turn it a weird colour. But these greens were such a great addition, because I consumed the great healthy benefits without even tasting it! Looks like you make a mean pancake ^_^ looks delicious! Very interesting addition with the spinach, I'll have to try that sometime! My unhealthy ones are even tastier than these. Unfortunately not something you can eat as often. The spinach was great because you got the benefits without even tasting it.